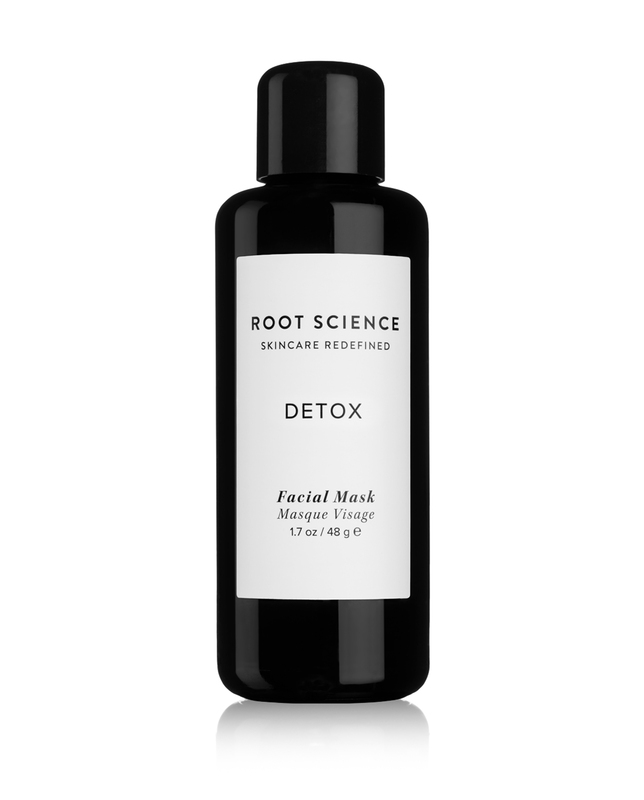 A weekly detox treatment designed for skin that is prone to breakouts, clogged pores and occasional temper tantrums. A concentrated, water activated formula that utilizes powerful mineral clays to remove excess oil and impurities, effectively minimizing the appearance of pores, blemishes and improving skin texture. A blend of soothing plants reduce the appearance of irritation and redness. Plant-based vitamins, minerals, and antioxidants work together to stimulate and renew, revealing a clear and healthy-looking complexion. Pro-Tip: Detox is a 100% concentrated powder formula that is water-free, eliminating the need for synthetic fillers and harsh preservatives. This allows you to customize your treatment and select a hydrator of choice, such as floral water, honey, or oil. By mixing oil or honey to the Detox powder, it will not fully dry on skin, ideal for areas on face that are prone to dryness. To effectively absorb impurities from pores and blemishes, mix with water and allow mask to fully dry. For those who are new to powder masks, we recommend mixing our powders in a bowl for ease of application and clean up. Take the time to experiment and have fun! This all-natural concentrated formula can tackle any blemish as a spot treatment or it will absolutely blow your senses away when used as a mask. Trust me on this one. Powder masks are seriously cool, but this one might take the cake. It look alike mud when mixed with water and brushed on, but it leaves your skin squeaky-clean and exfoliated. It has helped to recharge my face, giving me a distinct glow without irritating my sensitive skin, Plus, I love that I can mix the mask myself, it makes me feel like a mad scientist! Micro molecules supercharge absorption power, pulling excess oils, toxins, and impurities, reducing blemishes and stimulating blood flow for repair. Highly antibacterial, targets acne inducing bacteria, preventing onset of blemishes and accelerating recovery time. A powerful healing clay that’s rich in skin soothing minerals. Binds to toxins, excess oil, dead skin cell, minimizing pores, blemishes and improving skin texture. Renown wound healer and skin soother, carotenoids protect skin from environmental stress and sun damage. Youth enhancing Curcuminoids suppress melanin production for brighter skin and naturally occurring salicylic acid keeps blemishes at bay. Rich in phytonutrients, primary constitutents triterpene saponins stimulate collagen production, strengthening skin structure and reduce the appearance of wrinkles. Mineral rich clays are unrefined and sun-dried. Roots + herbs + flowers are sourced from certified organic farms. Wild medicinal plants are distilled to produce therapeutic grade essential oils. 11 active ingredients are hand blended in synergistic quantities proprietary to Root Science. Tried and tested by real people to ensure maximum skin enhancing benefits. Stimulating mineral clays and soothing herbs restore skin back to a state of harmony. Concentrated nutrients activate with water and powder transforms into a creamy pudding. Rich velvet mud cools skin on contact and detoxification begins. Housed in stunning dark violet glass for the highest standard in freshness and potency. Concentrated dry formula eliminates water induced bacteria and preservatives. Violet glass instead of clear prevents light degradation and rancidity. Purest form of organic + wild crafted ingredients are protected for skin safety and efficacy. French Green clay, also known as Illite Clay or Sea Clay, is mined from bedrock quarries in France. The clay we use at Root Science is of the highest quality, sun-dried, unrefined and contains no fragrance or additives. The use of mineral clay dates back thousands of years and has been used by people around the world for its miraculous skin benefits. 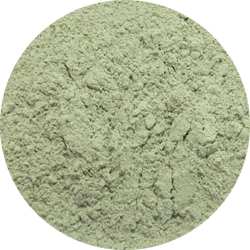 French green clay is a bio-mineral and contains natural minerals such as Silica, Calcium, Magnesium, Zinc, Iron, Copper, Potassium, Aluminum, Sodium, Selenium, Cobalt, Titanium, and Phosphorous. Along with the abundant mineral content, French green clay is also rich in phytonutrients, micro-algae and kelp. These inherent properties are the reasons why French green clay is a powerhouse of skin benefits. French green clay is also highly prized for its ability to stimulate blood flow to damaged skin cells. It tones, tightens and rejuvenates your complexion as it absorbs oil, impurities and removes dead skin cells. A savior for those with oily and problematic skin conditions such as acne. French Green Clay**, Bentonite Clay**, Kaolin Clay**, Calendula Officinalis (Calendula) Flower*, Matricaria Recutita (Chamomile) Flower*, Azadirachta Indica (Neem) Leaf*, Curcuma Longa (Turmeric) Root*, Centella Asiatica (Gotu Kola)*, Althaea Officinalis (Marshmallow) Root*, Glycyrrhiza Glabra (Licorice) Root*, Ulmus Rubra (Slippery Elm) Bark*. My saving grace! Everytime my skin freaks out I dawn on this mask and there is a SIGNIFICANT reduction in the size and redness of the blemish I’d say 80% erradicated. This product also has helped control blackheads, which I am very prone to. It has also reduced the size of my pores especially around my nose. Great product, price fairly. Highly recommend!! This mask is awesome! It’s done a great job at clearing out my pores and reducing shine caused by humidity. I have combination acne-prone skin, and this is really a game-changer when used weekly, reducing blemish size and giving my skin a nice glow while somehow reducing redness. I don’t know what kind of herb magic is going on here, but please never stop making this! Does exactly what it promises and then some! My blemishes and the redness around them goes down with just one treatment. Also does a wonderful job at keeping my pores clean. I’m only half way through my first bottle and its been 4 months, so a little goes a long way and its a great value for the quality of ingredients and gorgeous packaging! Yes, yes, YES to everything about this mask. I’ve been using this as a weekly mask on my face for about 2 months now and it works miracles! Every time after using it my face feels so silky smooth and literally feels like all the dirt and toxins have been removed. You use just a little bit mixed with water and it creates this thin mask for your whole face. You can feel it working it’s magic as it drys and tightens your face. Worth every penny. I’ve been using this as a weekly face mask and it does an amazing job at keeping my pores clear and I’ve noticed a major reduction in blemishes. It also works as a miracle spot treatment! My blemishes decrease in size almost immediately upon use and are completely healed within a day! A true savior for hormonal breakouts! Love the cooling effect it has on my skin and seems to work really well at decreasing redness around blemishes (making them less visible). All around another A+ product from Root Science. I absolutely love this mask! I’ve been using it twice a week for the past month. My skin appears more radiant and my pores are noticeably smaller. Adding this product to my regiment has kept my acne at bay which has been a challenge. I highly recommend this product. The powder to creamy mud is so much fun and feels amazing when applied. It feels almost like a cream once water is added but dries into into a clay mask after about 10 minutes. I’ve been using this for 2 weeks now and my skin is clear and pores are considerably smaller! Thank You! Just dropping by to say how much I love this mask! It’s been a life saver, especially when I’m prepping for an event and I’ve got a big ole 3rd eye that just wont go away! Thank You and please don’t stop making this! Cant live without! I purchased this for my hormonal breakouts I experience monthly and its done an amazing job! When I use this mask, it reduces the size of my pimples and they go away in half the time. I used to use harsh acne spot treatments and this has been the best gentle alternative I have come across.